Enrollment for the Spring 2017 Kindermusik and Music for Little Mozarts (keyboard) classes is now open at the Community Music School of Webster University. Open to children age's birth-6 years old, their music-and-movement activities are carefully and creatively designed to enhance cognitive, language, physical, creative, and social-emotional development. These fun parent-child activity classes help foster a lifelong love of and appreciation for the music itself. Classes begin between Jan. 30 and Feb. 4, depending on location. There are five convenient locations in the St. Louis area with a variety of class times to choose from, including Saturday morning and weekday evenings for busy working parents. Those who enroll for classes by Jan. 13 will receive a $10 tuition discount. 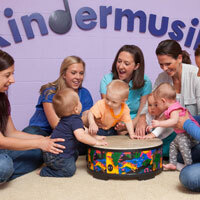 Try a free Kindermusik Demo Day class (Jan. 11-21). If you enroll for spring classes at a Demo Day, you can receive a discount. RSVP is required. For more information, class descriptions, times, locations and registration information please call 314-968-5939 or visit webster.edu/kindermusik.